My Santa Fe friend wasn't able to locate Fred & Bessie at the old depot. She had most of the ransom ready and everything. But she didn't want to leave boxes and boxes of butter out, or stacks of Dove chocolate bars. That's just crazy. I considered calling the police, but for Pete's sake! What do I say? Just call the police in Santa Fe and say, "Hi, my name is Flea... no, like on a dog. Really. No, stop it. It's F-L-E-A. Yes, just like on a dog. Huh? Oh, I'd like to report a kidnapping. 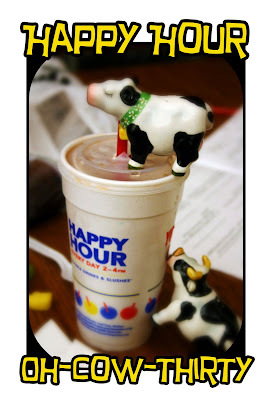 My ceramic salt and pepper shaker cows. No, it's NOT considered stealing, it's kownapping - I mean, kidnapping! They have their own blog, see, and ... really! Me? I'm calling from Tulsa, Oklahoma. No! They really were kidnapped! Look, they've been missing for about a month and ... I didn't report them missing because they were on their way to Washington. I got a ransom note demanding butter and chocolate ... I DON'T KNOW IF THE KIDNAPPER IS A MIDDLE AGED WOMAN. Geez. Actually ... I didn't even think of that. The POINT is, there are two scared little cows somewhere in Santa Fe and I would like to get them home. Stop it! Stop laughing! Oh ... oh ... never mind." I hope I see them again. And that tee is too teat er t'weet! Oh my - so the hunt for the bovines continues! Good luck! I will pray for their safe return. Did you even authenticate the ransom note? You had better check out In The Gutter for an update on the bovines. You will be pleased! Oops - I mean Asthmagirl's blog - I got temporarily confuddled by my lack of sleep. It is Is My Cape fluttering you need to check out. It IS possible to be lost in New Mexico. There are few mountains to sight for your directionality. However, that Rio Grande is not nearly as Grand as its name implies. Creeks in New York are bigger. Well, of course the police will laugh if you report your cow(s) missing. They laughed at my mother when the cut-out yard decor cow (aka "the Merry Mooer") disappeared. Mom is still traumatized by the incident. Stuck in New Mexico, it sounds like a dream! I would cry with worry if I hadn't read the later post first. Naughty naughty little bovines. I do have a link to these chokolat eating wanderers though. That reminds me...have you ever had Ben & Jerry's "Vermonty Python"? It has little fudge cows in it. Seriously. Awesome. You can look up the flavor on their website to see which store(s) near you carry it.